Don't forget! "Racing Dreams" Saturday at Old Town Cinema in Louisville! Here’s another fun BIFF preview event! 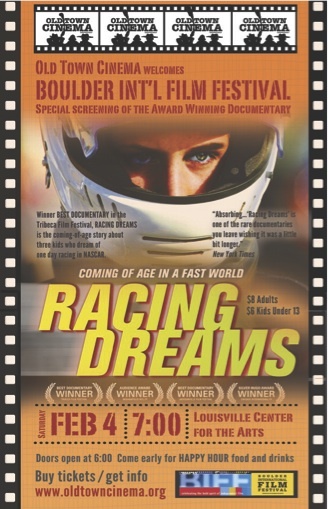 Check out “Racing Dreams” at the Old Town Cinema in Louisville Saturday! This award-winning documentary (Jury Prize, Best Documentary, Tribeca Film Festival) will be presented on Saturday, Feb. 4 at the Louisville Center for the Arts at 801 Grant St., in the beautiful period auditorium next to Memory Square. “Racing Dreams” was a big hit at BIFF 2010. This year, its director Marshall Curry has a feature documentary in contention for Best Documentary at the Oscars – “If a Tree Falls . . . A Story of the Earth Liberation Front.” CURRY WILL INTRODUCE THE FILM VIA VIDEO! Oh, the magic of technology. DON’T MISS THIS EXCITING FILM! Doors open at 6 p.m. for food and drink – film starts at 7 p.m. We will be there, too, to talk, and answer questions, about BIFF 2012. This is our last big party before we put on BIFF 2012 – we love hooking up with our faithful fans in East County. Come on down and let’s have fun! And did we say you can win tickets to BIFF's Closing Night film, award ceremony and party? We didn't? WELL YOU CAN! For tickets and information, please go to http://www.oldtowncinema.org/. SEE YOU THERE! 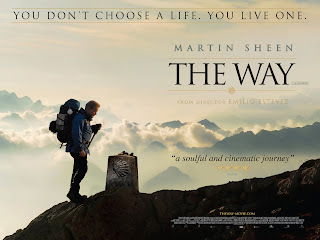 See Sheen & Son's latest -- "The Way"
In another amazing example of different organizations working together, BIFF is happy to announce that the Boedecker Theater at the Dairy Center for the Arts, 2950 Walnut St. in Boulder, is showing the latest directorial effort of Emilio Estevez, "The Way." This film stars the director and his father, the latter of whom you may have heard of -- Martin Sheen? This moving and complex spiritual epic was completed in 2010, and the unique collaboration between father and son is riveting. It is an excellent reminder of why Mr. Sheen is our guest of honor at BIFF on Saturday, Feb. 18, at the Boulder Theater. 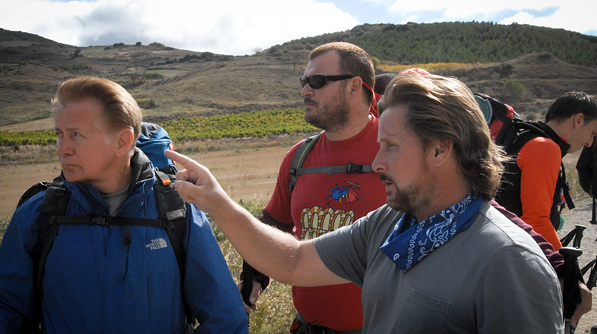 In the film, Martin Sheen plays an American doctor who comes to France to collect the remains of his adult son (played by Emilio Estevez), killed in the Pyrenees in a storm while walking the Camino de Santiago, or The Way of Saint James. Rather than return home, he decides to embark on the historical pilgrimage to honor his son's desire to finish the journey. "The Way" was filmed entirely in Spain and France along the actual Camino de Santiago. So don't miss this wonderful film, not least so that you can ask Martin about it when he comes to town. It plays on Friday at 4:30 p.m.; Saturday at 3:30 and 8 p.m.; and Sunday at 7 p.m.! See you there!